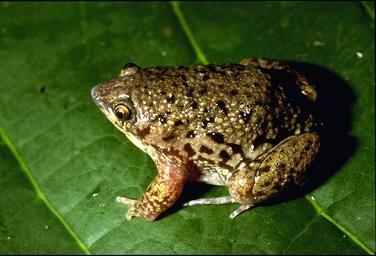 The family Hemisotidae is made up of shovel-nosed, globose-bodied frogs within a single genus, Hemisus. Their hard-pointed snouts, strong forelimbs and hindlimbs, and loss of a sternum (convergent in Rhinophrynus) allow these frogs to be quick and efficient headfirst burrowers in tropical savanna of sub-Saharan Africa. They lay eggs underground in the plains near the end of the dry season. Nests are flooded and tadpoles then swim to temporary pools of water to finish their development. Tadpoles also wriggle onto the parent's backs to be transported to water.